I'm using Acronis Recovery for MS Exchange. In an earlier stadium we stored our backup to a NAS (configured as iSCSI device/drive) on our 2003 SBS server. Now we reconfigured the backup and we are trying to reconfigure our exchange backup task. Is there any solution? 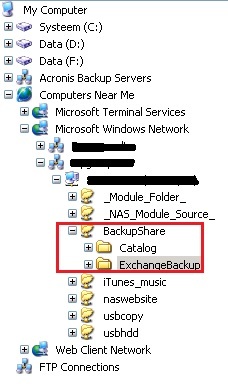 I would like to backup exchange data to a network drive stored on a NAS. Please try to modify the backup script located in this folder: \ProgramData\Acronis\Scripts\. Please close the Management Console. You can open it in a text editor and replace the existing mapping with the new mapped drive to the NAS. You need to restart the Acronis Remote Service after this modification. I cannot find the directory mentioned. See atached the only thing i can find. AS i can see there is no config file or subdirectory called scripts. How i the backup script file called? The picture shows the folder Program Files, not ProgramData. You should type or copy the path into the address bar of your Windows explorer. At my machine it was c:\ProgramData\Acronis\Scripts\. The path is by default hidden. There is no hidden folder called programdata on the server. What is the filename i am looking for? I apologize, I posted first the folder for Server 2008. This one exist on my 2003 server. I have changed all the config files from to the correct network drive. Will test this asap. It realy does exist. Should i try to configure the UNC path? Like \\192.168.x.x\Share\folder ? I need a different username/password to connect to the share. How do i configure this in the backup scripts? Create a backup plan to a share or drive that is accepted from the product but is not your real target (e.g. temp_path). At the credentials, provide the credentials that you need for the target destination (e.g. target_path). 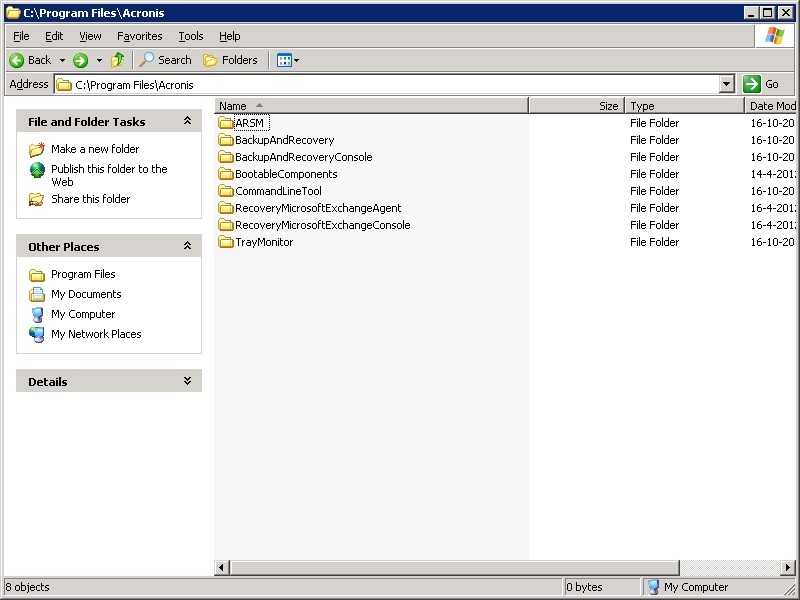 Save the backup task and close the Acronis Recovery for MS Exchange Management Console. At the script replace the 'wrong' (e.g. temp_path) entered path with your target path (e.g. target_path) and save the file. The backup task will now save the backups at the target. Problem is solved Peter! The last procedure was the solution. Thanks!